Over the past six years we have established ourselves as one of the most experienced vegetable oil conversion shops in the country with over 300 conversions to date and we are the most experienced dealer/installer for Golden Fuel Systems - the nations leading conversion technology company. We have led classes on the basic principles of using vegetable oil as a diesel fuel locally and as far away as Santa Fe, NM, and we have given professional presentations to local audiences such as the Cleveland chapter of the American Society of Mechanical Engineering. I have been passionate about alternative fuel solutions to our current energy crisis ever since I began to learn about the importance of biofuels as an evironmental studies major at Oberlin College. Intrigued by the idea of creating fuel from waste, I devoted my energies to figuring out a way to pursue this endeavor on a local level. I was able to secure several sources of funding to develop a local alternative fuel station and conversion facility through grant programs and scholarships including an American Public Power Association Scholarship and a Compton Mentor Fellowship. I graduated in 2005 with honors from Oberlin College with a BA in Environmental Studies. Much of my time in college was dedicated to learning about biofuels and starting local biofuel initiatives. I was first introduced to vegetable oil based fuels on a field trip to Cleveland's Great Lakes Brewery during the fall of 2002, when I was a sophomore. Intrigued by the idea of creating fuel from waste, I spent the winter of 2003, along with two other students, building a biodiesel processor at Hampshire College with a small research grant. After successfully creating this processor in Massachusetts, I returned to Oberlin eager to start something local. I founded Biodiesel Oberlin (BO), a group comprised of Oberlin College Students, Staff, Professors, and Oberlin community members dedicated to raising availability and awareness of biofuels in Lorain County. In the spring of 2003 I received an American Public Power Association Scholarship to research the use of biodiesel in generators at Oberlin Municipal Light and Power Service and worked with a team of students and professors to apply for funding from the EPA's People Prosperity and the Planet Sustainability Challenge. In the summer of 2004 I expanded my biofuel experience by converting my 1998 VW Jetta to Straight Vegetable Oil (SVO). In the fall of 2004 our BO team received the EPA funding to build and run production tests for a community-scale biodiesel production method. I spearheaded the BO team that fabricated a mobile (installed in a race-car trailer), off-the-grid (solar and bike-powered), and educational biodiesel processor. Our processor not only recycled a local waste product to power local equipment (including a bobcat skidsteer, a woodmizer mill, a couple pick-up trucks and a fuel oil furnace) but it also was used to educate college students, community members, and children at the Oberlin Public Schools about renewable and alternative energy sources. Two months before graduation I received a Compton Mentor Fellowship to create a biofuel resource center in Oberlin, called Full Circle Fuels. I developed a relationship with the nation's leading vegetable oil conversion specialists - Golden Fuel Systems (formerly Greasel Conversions) - and began to perform conversions on passenger vehicles. As the business grew I became extremely experienced at converting many different types of vehicles. Today I bring that experience to every conversion we perform at Full Circle. 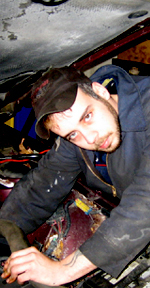 Joe is a certified automotive technician with over twelve years of experience in engine performance, engine repair, automatic transmission/transaxle, manual drive train & axles, brake systems, suspension & steering, electrical troubleshooting and heating & cooling. He also trained at Columbus State Community College in aviation maintenance, is an independently certified ASE, has macs certification, and is trained in Genisys. Previous employment at Bridgestone/Firestone (Chicago, IL & NYC. ), Edgewater Beach Auto (Chicago, IL), Complete Car Care (Oberlin, OH), Beckett Automotive & Performance (Oberlin, OH), National Laser Parts & Service (Oberlin, OH), and Midas (Bethesda, MD).